Drawing on qualitative fieldwork at three large agencies, this article adapts Richard Johnson's "circuit of culture" (1986) as a framework to examine both the material practices that help reproduce an overwhelmingly white labour force within US advertising agencies and the ideological screens that conceal them from scrutiny, critique, and reform. 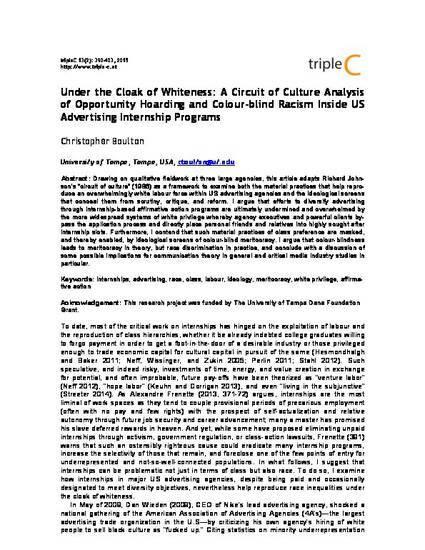 I argue that efforts to diversify advertising through internship-based affirmative action programs are ultimately undermined and overwhelmed by the more widespread systems of white privilege whereby agency executives and powerful clients bypass the application process and directly place personal friends and relatives into highly sought after internship slots. Furthermore, I contend that such material practices of class preference are masked, and thereby enabled, by ideological screens of colour-blind meritocracy. I argue that colour-blindness leads to meritocracy in theory, but race discrimination in practice, and conclude with a discussion of some possible implications for communication theory in general and critical media industry studies in particular. tripleC: Communication, Capitalism & Critique. Open Access Journal for a Global Sustainable Information Society provides a forum to discuss the challenges humanity is facing in the capitalist information society today.